Lawrence Block’s fourteenth entry in his long running Matt Scudder series is by far the most tragic. The loss of life within these pages is astounding and there came a time near the end where I thought very few would make it out alive. Hell, if I didn’t know there were more books to follow, I’d have had my doubts about Matt too. Matt’s close friend – and ruthless Irish gangster – Mick Ballou is at war. Someone is picking off members of Mick’s organization and when Scudder is tasked to produce the identity of this murderous maniac, those close to Matt are threatened unless he backs off. Given how little he’s accomplished during his investigation, it feels like a blessing in disguise – he can get off without the guilt associated with disappointing Ballou. Unfortunately for Matt, Mick’s nemesis strikes before Scudder can officially get his hands off the case. What follows is some of the most intense, nerve-wracking storytelling the series has ever produced and I would go so far as to say that Everybody Dies is my favorite of the series up to this point. Everything that makes a great Scudder story lives within this book; late night philosophical rap sessions with Ballou, comedic exchanges with T.J., butting heads with the police and memorable moments with Elaine – but you take all of those elements, add an unseen level of unpredictability and you have a novel that will keep you up at night. 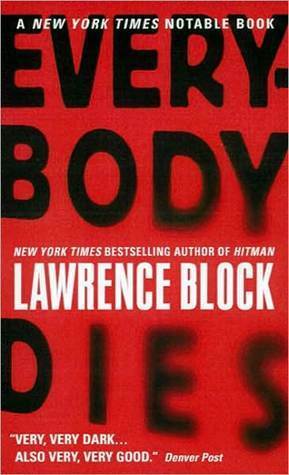 Everybody Dies is so violent, so deadly, that I often wondered if Block had taken tips from George R.R. Martin in how to cause his audience grief. However, when you pick up a book titled Everybody Dies, you should know what you’re in for. October 9, 2014 in Fiction, Lawrence Block.